Gentlemen, your big day is coming up and the ladies aren't the only ones who get to prep and pamper themselves to be camera ready. There are plenty of ways to ensure you're looking like a million bucks too! 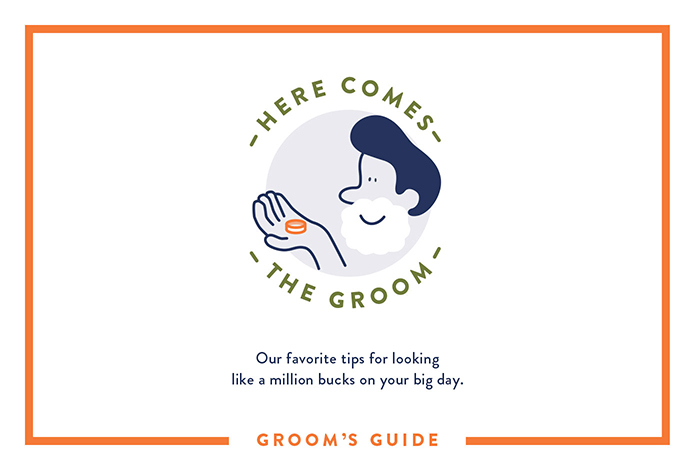 Here are a few tips and suggestions, incorporating a great graphic from Harry’s, to help you look and feel good when you say "I Do!" getting some exercise in will not only help you look better, it will also help you feel gooD by releasing lots of endorphins that help to trigger positive feelings in the body :) Whether you're a gym fanatic or someone who has never set foot in one, Working out can be difficult. Having a friend along the way can make things a lot easier, is a great way to make sure you're staying on track, and will keep things fun! It's tough to start at first, but once you get into a routine, things will get easier... we promise. - A gym membership or drop-in class somewhere can be EXPENSIVE! One great alternative is to sign up for a program like ClassPass which gives you access to tons of studios/classes in your area for one low monthly price. There are also tons of free phone apps and online videos you can find if you don't have the spare time or money to go somewhere to workout. Everyone deserves to pAmper themselves every now and then. Whether You stressed and planned over every detail of the wedding day, or got second-hand stress from someone else managing all of the details, you've gone through a lot to make the big day perfect! 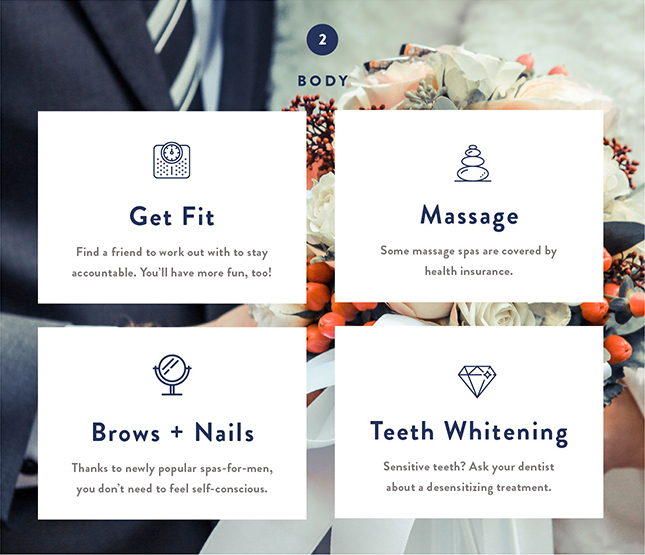 A massage or day at the spa is a great way to de-stress and relax a little so you can fully enjoy your wedding day and not carry all the hard work you've put into the wedding on your shoulders anymore. Manscaping should be on every grooms To-Do List before the big day! Pedicures, Manicures, and eyebrow trimming/plucking isn't just for women.... Grooms need some TLC in these areas too! Either do it all at home or head into a salon to let the experts handle it. And Don't be EMBARRASSED about going into a salon to get these tasks done either... it's totally normal. You'd actually be surprised by just how many guys are starting to go these days for all of their Guy-geuine needs. Not only are you going to be surrounded by all of your cloest friends and family on your wedding day, You're also likely going to be photographed more than on any other day of your life! Make sure your pearly whites stand out and look their best. You can visit your dentist for a professional cleaning/whitening or use a popular over-the-counter treatment, like the one listed below, while staying in the comfort of your own home. You don't want any unwanted surprises on your big day, and that definitely includes your hair cut! Make sure you get a cut no more than 5 days away from your wedding day to unsure sharp and crisp lines and either stick to what you've had done in the past, or choose a new style at least a few months out the make sure it fits what you want. Everyone hair and preferred style is different so we can't really give you any direct suggestions here. Just make sure you try out whatever you are using before the wedding day and ensure it'll hold and last 12+ hours to get you from getting ready photos to getting down on the dance floor.